John Waller was born in Melbourne in 1954, moved to Brisbane in 1959 and moved back to Melbourne in 1994. John currently works and lives in Darwin. Today, John is an artist working predominately with digital media, his current practice focusing on the development of computer animation, video and sound for screen, projection, and installation projects. During the 1980’s and early 1990’s John was an active participant in the diverse Brisbane artist-run sector. In late 1984 and early 1985 he co-founded the artist-run space That Contemporary Art Space at the rear of 20 Charlotte Street with Paul Andrew and a collective of other artists including Dianne Heenan, Wayne Smith, Annette Coulter, Robert Kinder, Sue Palmer, Jane Richens, Paul Milburn, Sally Hart, Christopher, Hollie, Yvette Kiorgaard, Jenny Chirnside, Lindy Collins, Brian Doherty, Rebecca Chapman, Jay Younger, Dale Chapman, Jeanelle Hurst and Zeliko Maric. John was also on the founding committee of Art Worker’s Union Qld. In the early 1980s John had an artist studio located on the second floor of the Brisbane Community Arts Centre at 109 Edward Street and later had studios at Loch Street, West End , That Space, Margaret Street, George Street. 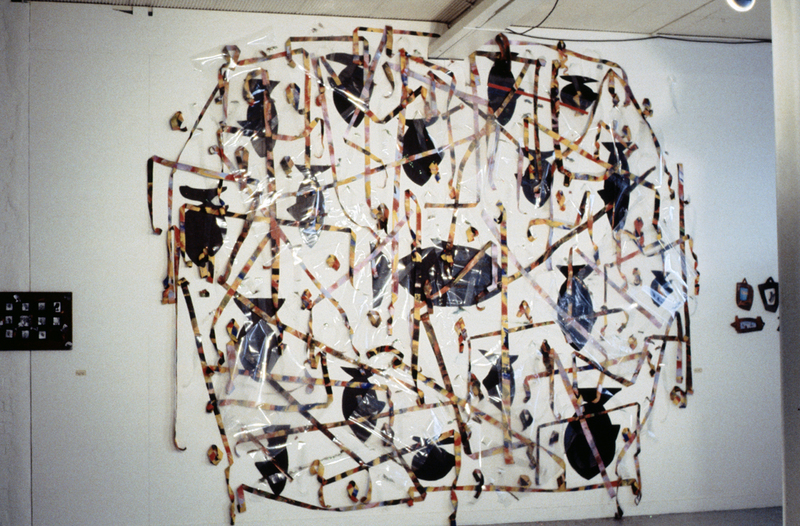 John held numerous solo and group exhibitions during that period, including the That Space opening exhibition and the This Work Was exhibition, with artist Brian Doherty and others, both held at That Space in 1985. In terms of related artist-run spaces around that period, John also showed at John Mills Annex, Arch Lane Public Art, and Galerie Brutal, in Brisbane, Rondeau in Sydney and Code View in Melbourne. In terms of institutional spaces he showed at the IMA, MOCA, curating the Random Access exhibition at MOCA, Queensland College of Art Gallery, the Queensland Art Gallery, and the Gladstone Art Gallery in Queensland; an Artspace annex and the Ivan Dougherty Gallery in Sydney; the Film and Television Institute, Fremantle; and Victorian Writers Centre, Ausgraph 90, Linden Gallery, and the RMIT Faculty Gallery, Melbourne. He also exhibited internationally in SISEA, the Netherlands, Camerawork Gallery, London, Media Wave 93, Hungary, and 2B/The Garage, an artist run space in New York. In 2008 John completed a PhD in the School of Art at RMIT, developing entity, an artificial life inspired interactive animated character, to explore interactive engagement and the possibilities an artificial life approach to programming might offer such a character. Currently John is treasurer for the Darwin Visual Arts Association (DVAA), an ARI in Darwin. In 2009-2013 he was on the board of management for J-Studios an artist-run studio and gallery complex in North Fitzroy, Melbourne. For the past two years John has been lecturing in Interactive Digital Media at Charles Darwin University. However, he has finished his time there and is about to head back down South. 1980’s Queensland and Brisbane Social History: By way of a detailed personal snapshot, the milieu you experienced during the late 1970s and early to mid 1980s as a young artist living, working, collaborating in Brisbane, what sort of world was this Queensland for you John? After leaving the Seven Hills College of Art in late 1980 I was an artist looking around for a community to connect with. However, there wasn’t much of a community around at the time. There was Ray Hughes in Red Hill, Verlie Just Town Gallery in Queen Street and Philip Bacon in James Street, New Farm in the way of commercial galleries. There was the Royal Queensland Art Society in Little Edward Street and the Institute of Modern Art, initially in Market Street and then in Edward Street. To me, it felt like a cultural desert. I hung onto the Institute of Modern Art for dear life. Then a few other things started to happen — there was Red Comb House artist studios set up in early 1982, One Flat Exhibit the same year, A Room later in 1984, and the Art Workers Union (Qld). On the positive side it was a time of camaraderie. From helping to set up the Edward Street location for the IMA to move into from Market Street, to organising and setting up That Space (especially That Space for me), there was a strong sense of cohesion and mutual support. If nothing else activity in the artist-run scene made work visible to the art institutions. John, the Bjelke-Petersen regime, “The Police State” political Backdrop how did it impact upon you? Not much in a direct sense. I didn’t like many of the things that were happening, but they were in the background for me. I guess I grew up with it and was therefore acclimatised to it. It was more that you felt like you were vaguely under siege. Reading about some of it much later in Andrew Stafford’s book Pig City, I was aware of many of the things that were happening but I was not directly involved in them. How did this political climate directly impact on your friends and peers? I know at least one friend who left directly because of this at the time. And John the type of art work you were making during the 1980’s? Painting, then photocopy work. In 1989 I bought my first computer. I was born in Melbourne, moved to Brisbane when I was five, and grew up in Brisbane suburbia, attending local state schools, playing in back yards, under mulberry trees, and in the local park. Is there a vivid memory from your childhood when you knew you wanted to become a professional artist or media producer? I was interested in both physics and art at school. However, because of timetable conflicts I couldn’t take both science and art subjects in my senior years at high school. Initially science won out and I took those subjects. However, in my early twenties I enrolled in Senior Art classes at night school, got hooked on art, and haven’t looked back since. Though I still maintain a lay interest in physics, and science in general – for example, the foray into artificial life for my PhD work entity. Early Art Education in a bit more detail? In years 8–10 at high school we had a couple of great teachers, and some great student teachers as well. In primary school we used to have an art afternoon once a week. I can still remember our pastel books with green covers and grey pages. We also had craft classes once a week, different year levels we would explore different craft media. One year it was plasticine, another plastic based crafts like plaited key rings and patterned place mats, another year it was basket weaving. Hardly art training but a chance to make things none-the-less. I studied at the College of Art in Seven Hills, Brisbane. Started in 1978, deferred in mid 1979, came back at the beginning of 1980, and then finally formally “resigned” from the course in the second half of that year. In the end I was more or less forced to drop out because of artistic/pedagogical differences with particular teachers — so my time there was not unproblematic. However, there were some good teachers that I either had at the time or came into contact with later, and the overall experience there — immersion in art, and contact with my fellow students — was invaluable. On the art practice side I fondly remember art teachers Ian Smith, Peter Charnock, Nora Anson, Russell Craig, and John Rigby who I found were generous and open-minded. And John Elliot, who I did not have as a teacher, but who I got to know later. There were also good teachers in the humanities. Post art college, in the mid-eighties, I audited two versions of an Experimental Music subject at the University of Queensland. The first time covered the area that might formally be called Experimental Music — Varese, John Cage, minimalism, etc. The following year I took the subject for a second time, this time it was taught by Gerard Brophy and covered experimentation more in a main-stream orchestral environment — Stockhausen et al. Fantastic to have covered both approaches. And sound is often an important element in my work, so having that background has been invaluable. In the mid-nineties I studied for an Advanced Diploma in Electronic Media at RMIT, mainly to gain mainstream computer skills. I had been teaching digital media at Mt Gravatt TAFE in Brisbane and realised that, being self-taught, my computer skills were rather idiosyncratic. So I headed to Melbourne, partly with the idea of getting some mainstream computer skills for teaching purposes, partly because I felt I had run out of institutional and commercial art opportunities in Brisbane, and partly just for somewhere new to live. Then in the late nineties I started a degree in computer science with the idea of improving my programming skills. However, while I enjoyed programming when it had a visual outcome, or art outcome, I felt like I was being trained to program data-bases for a bank, which wasn’t my cup of tea at all. So after a year I ran away screaming, and enrolled in what was to become a PhD in Visual Art. Though I took what I had learnt in computer science and applied it to my PhD project. Tell me about your self-directed education? Tell me about your sense of place at the time living and working as an artist in Brisbane, did you feel a sense of belonging? I guess growing up in Brisbane made me feel like I belonged. Later on the involvement with the local art scene and local artists, local studios and galleries like the IMA, That Space, John Mills National and The Observatory. Tell me about your artist colleagues at the time who were also involved in the artist-run scene, and was there a shared world view? I think I first met artist Ted Riggs while I had my studio in the Brisbane Community Arts Centre. Ted was using the space next to mine to paint a set for Who’s Afraid of Virginia Wolf that was to play in the Centre’s theatre. Barbara Campbell I knew a tiny bit from QCA. She was a year or two below me, but I remember her Tea Lady performances where she would come around and play a tea lady while we were in class. 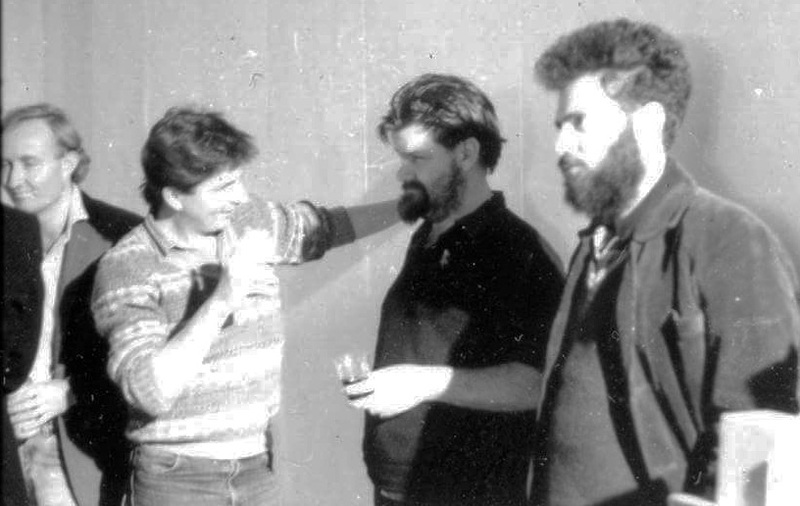 Brian Doherty, I guess I knew from the IMA and he was of course a driving force, if not the driving force, behind the Art Worker’s Union (Qld) which started in 1982 or 1983. Adam Wolter was one of our two resident digital media artists, along with David Crouch. I had collaborated with Adam on an art project for the foyer of La Boite theatre. However, it wasn’t until we were working on a piece to put into the collaborative InterFace 88, City as a Work of Art project in the Queen Street Mall, using Deluxe Paint on his new Amiga computer, that I realised that I too could use this as a medium for art making. Adam was adapting artists’ images for the clickerboards that were located on the facade of the Wintergarden building in the Queen Street Mall. I got to draw my image directly onto his computer using Deluxe Paint. It was then that I realised that I could use this as a medium for artmaking. For our earlier collaboration at La Boite theatre, Adam had contributed an animation which he showed on the computer he owned at the time. He had to program every line of the images as well as the movement, and at the time I thought I would never be able to do that. The simplicity and directness of the Amiga computer platform opened up a whole new world of possibilities for me. David Crouch was our other resident digital media artist at the time. He had majored in sculpture at the College of Art in Seven Hills during the late 1970s but by the mid-1980s was tinkering with electronics and building a robotic drawing machine which he showed at That Space and in the Random Access show at MOCA. David and I collaborated with Jacqueline Eyers, Adam Wolter and Tony Moore on the K/nights in Shining Amour exhibitions at Galerie Brutal and the IMA. Jeanelle Hurst, who co-ordinated the InterFace ’88 City As A Work of Art project in Queensland, I knew from her early involvement in the Artworker’s Union (Qld) and from One Flat/O’Flate, along with Adam Boyd, Zeliko Maric and Russell Lake. I enjoyed the One Flat /O’Flate projects immensely. I especially remember Hollie’s shows held at One Flat, George Street; tall wooden figures, dark and burned, and the vibrant work a few years later she made in her studio at That Space for an IMA Annex show, Bird Dances For Shiva, and later at the Butterfactory in Dayboro (though perhaps what was just in her studio) — and the fantastic hand-made invitations Hollie used to produce for her shows. Hollie was also one of the people who signed the original lease for That Space. Then there were all the artists that helped us set up That Space – Jay Younger, Jenny Chirnside, Wayne Smith, Sally Hart, Rebecca Chapman, Dale Chapman, Paul Milburn, Annette Coulter, Yvette Kiorgaard, Christopher, Lindy Collins, Allen Owen, Jeanelle Hurst, Zeliko Maric, Adam Boyd, Russell Lake, Brian Doherty, Robert Kinder, Sally Hart and probably a handful of others that I can’t bring to mind at the minute. Nick Zurbrugg was an active part of the Brisbane art scene in many ways – as artist, curator, writer, teacher, collaborator, supporter, cobber, and all round nice guy. It was wonderful to have Nick around as a member of the art community. We would have been that much poorer without him. Regarding the question about a shared world view: I’m not too sure about having a shared world view but it was good to be part of a community with at least some kind of shared sensibility. Tell me about your most vivid and earlier exhibition/arts event experiences? The Pop Art Exhibition at the Queensland Art Gallery when I was in high school and the gallery was located in Gregory Terrace in the Old Museum Building. And more broadly your experience of the diverse and vibrant indie music scene ? Tony Moore from the bands This Five Minutes and Dog Fish Cat Bird was a close friend, so I used to go to their gigs and the events organised by Peter MacPherson, Pat Ridgewell and Ian Wadley. I also remember The Liquorice Lounge at various locations including the Brisbane Community Arts Centre (BCAC). My contribution to these events was to supply the cat image for the rubber stamp used as a gig pass out. And for A Night on the Tiles gigs, also at BCAC, I painted the stage backdrop and the works to decorate the venue. This year marks the 40th year anniversary of the IMA, tell me about the role the IMA played in your own personal experience during this period? My first contact with the IMA was probably 1979 or 1980 when I was at art school. I remember shows by Michael Craig-Martin and Imants Tillers. On leaving art college, like I said previously, I hung onto the IMA for dear life. There wasn’t much else around in terms of art community until a little later. And later I was included in several shows there when Peter Cripps and Nick Tsoutas were the IMA directors, so it was important to me in that regard as well. 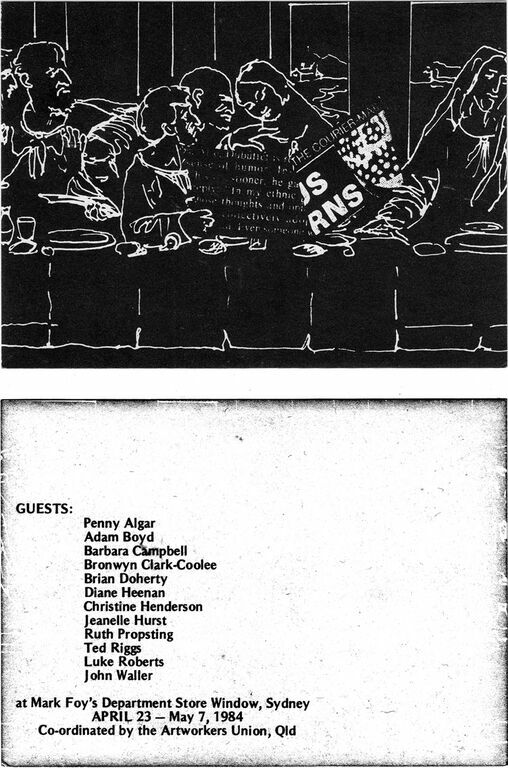 And what do you recall from the 1982-1984 guest curator period with Ted Riggs and Barbara Campbell? Yes, I thought this was a fantastic period. My understanding is that the guest curators were selected on their curatorial ability, and not on the particular project they were putting forward. This meant there was a wide range of artists and art practices shown. Great for someone just out of art college. I also remember the regular film nights organised at that time by Brian Doherty. I particularly remember a screening of Len Lye’s animations, which was the first time I had seen his work. Fantastic stuff. Tell me about any direct measure of support, patronage and interest from established institutions you received during this early time in your career, an era when today’s commonly used term ’emerging artist’ didn’t have the clout it does today maybe? The Queensland Art Gallery purchased one of my large scale photocopy works at the end of the eighties; Study for an Untitled Landscape ( New Holland I ), and a large scale computer print work was included in the Instant Imaging exhibition held at the QAG in 1991. As I mentioned, before my work was included in several IMA exhibitions. So that was important for me. And M.O.C.A., run by art entrepreneur James Baker, put on the Random Access exhibition of photocopy and computer work that I curated in 1989. Where did the developing artist-run scene fit into the broader Queensland infrastructural scenario ? The ARI sector was great for me in that it gave exhibiting opportunities that I otherwise would not have had, and a community to work within. And it probably facilitated interaction with institutional venues that would not have happened otherwise, like the IMA, MOCA, and the Queensland Art Gallery. As I mentioned earlier the Queensland Art Gallery purchased one of my photocopy works. Anne Kirker, Curator of Prints, Drawings and Photographs, had seen the work first in my studio, second in the Random Access exhibition at MOCA, then at a two person exhibition with Daryl Graham at Arch Lane Public Art. It was after seeing it three times in these different locations that Anne was convinced to put my photocopy work forward for acquisition by the gallery. So in some very concrete ways the artist run and more institutional activities actually became quite integrated. Jim Baker from MOCA was extremely supportive of the art scene in general. As well as supporting my Random Access exhibition, he would turn up at many art events, in institutional, commercial, and artist-run venues alike, and purchase work by local artists. These artist-run activities ended up being an integral part of the art scene, not only for the artists and the grass-roots community that evolved around those activities, but also for the broader art community as well. In many ways the artist-run activities, as well as being important in their own right, became an incubator, or a series of incubators, that fed into the rest of the art community. And when you get to projects like artist Jeanelle Hurst’s InterFace ’88 project, City As A Work Of Art you have projects that are on a physical scale and reach a public in a way that would rival any institutional project — and without the compromises that a public institution might need to make. These artist-run activities ended up being an integral part of the art scene, not only for the artists and the grass-roots community that evolved around those activities, but also for the broader art community as well. In may ways the artist -run activities, as well as being important in their own right, became an incubator, or a series of incubators, that fed into the rest of the art community. And when you get to projects like artist Jeanelle Hurst’s Interface Project, City As A Work Of Art you have projects that are on a physical scale and reach a public in a way that would rival any institutional project — and without the compromises that a public institution might need to make. Pre- internet the question many artists ask is how did you network, share and co-mingle back in the day? We networked at exhibition openings and other events, like White Chairs in Elizabeth Street and the Green Room at the New York Hotel, Lucky’s, La Boite, indie music gigs like The Liquorice Lounge. An invitation to the Artworkers Union (QLD) contribution to Art Space/Street Space, 1984. Why do you feel there was such a proliferation of ARI activity during the 1979-1990 period in Queensland? It just seemed like a natural thing to do. At the time there wasn’t much in the way of art infrastructure so we had to make our own. As artists we needed to make a space where we could do what we wanted to do in terms of exhibiting, performing, networking. Sometimes this meant setting up galleries and studios, but sometimes this meant other more public offerings like the City As A Work of Art and related projects like AXIS Art Projects and art magazines like Art Wonder Stories and Art Walk, and eventually Eyeline. Artspace/Streetspace was an exhibition organised by Artspace that utilised the shop front windows of the old Mark Foy’s department store in Sydney. The Qld Artworkers Union organised for a group of Brisbane artists to use one of the windows over the period of the exhibition. Artists involved were Penny Algar, Adam Boyd, Barbara Campbell, Bronwyn Clark-Coolee, Brian Doherty, Diane Heenan, Christine Henderson, Jeanelle Hurst, Ruth Propsting, Ted Riggs, Luke Roberts, and John Waller. Designer: Not sure, I think we all had a bit of a hand in it, but there was probably someone who took editorial control. Tell me about setting up the Artworker’s Union (Qld) in 1982 and something the ephemera you produced at the time? I remember the days of forming the Artworkers Union Qld. Lots of meetings developing our Aims and Objectives and developing the constitution. I remember helping to organise the Everything you wanted to know about the visual arts but couldn’t find out conference, which I recall as being quite successful. I also remember having difficulty with attracting members once we started. Artists didn’t seem to be interested in a “union” as such. After a couple of years a group of people, including Brian Doherty I think, put forward the alternative idea of the Queensland Artworker’s Alliance, I guess a body that was more obviously a professional association rather than a union. We had a meeting in May 1986 at the then Brisbane Community Arts Centre (now Metro Arts), handed over the reigns to the Artworker’s Alliance and the rest is history so to speak. I am sure Brian Doherty and Peter Anderson can provide a much more detailed account about various aspects of that time, people and processes involved. The question of ephemera production? At the time the ephemera for me was largely promotional in nature, communicating what was coming up and where. However, now it serves as a concrete record of the time and I wish I had kept much more of it. And the notion of archiving and photo documentation, was this important for you during your 1980-1990 Brisbane years, so as not to forget, to obtain funding and so on? At the time I was just documenting my own work. Now I wish I had documented events as well. But then we didn’t have cameras in our phones back then. I had an SLR back then but now wish I also had an instamatic camera or something similar to take snaps with. Again, recollecting pre-internet, Mail Art was a prolific form of ephemera/art making for artists since the 1960s and 1970s, particularly since a genre of post object art, that blurred the boundaries of mail, a public state based activity and art, generally a more private means? True, Mail Art was very popular for a while there. I was only involved in one mail art project and that wasn’t until 1993. It was a show that was mailed to sites in Italy and Germany, organised by either Mark Holden or Neil Degney. Thanks John, picking up on how That Contemporary Space began from your point of view from the initial meeting held at the IMA in late 1984, organised by IMA Director and artist Peter Cripps? When Barbara Campbell (and maybe Ted Riggs) rented an upstairs studio space in George Street, the room next to the studio was vacant. I thought it would make a good gallery space, so I started thinking about what I could do with it. I spent a lot of time thinking and talking about models, of how I might set something like this up, what form it might take, etc. In the meantime the A Room collective rented the space. So that put my thoughts on hold for a while. A Room was a six month project involving seven artists who held exhibition and performance events in the space during that time. At the end of the A Room time I approached Di Heenan, who was one of the A Room artists, to see if she would be interested in starting up some kind of longer term artist-run gallery together. The space I was thinking about was something of the professional calibre of A Room, but to be open to artists in general, with some sort of peer-reviewed selection process. I was interested in a space where the most adventurous and challenging (emerging?) artists could show their work – what I thought of as cutting edge. Exactly what I meant by that I probably couldn’t define clearly at the time, let alone now. But I guess I meant artists working in what I saw as some sort of contemporary manner, being adventurous, taking risks, making what I and/or my peers thought of as interesting work. In any case Di liked the idea and we started looking around for an appropriate space. Not long after this you (Paul Andrew) called a meeting at the IMA, saying that you were looking to set up an artist-run gallery and were looking for support. So the three of us joined forces and started looking together. I remember the three of us driving around in Di’s Renault looking at spaces in West End, Paddington, The Valley, Red Hill, Highgate Hill and the city. Then Di got a job at the Director of the Gladstone Art Gallery which left two of us looking. There was also a group of interested artists that emerged from that meeting you and Peter Cripps called at the IMA, which proved to be vital to That Space. They would offer feedback and moral support, and view sites we thought were promising — and would eventually form the core of the That Space collective. In the meantime, Tony Moore, from the band Dog Fish Cat Bird (who is pictured above in a Shared Camera photo of their gig at That Space in 1986), had a writing space in the John Mills Himself building at 40 Charlotte Street. The building was being rented by a group of architecture students from QIT, the Entrepot Collective. So I contacted Mark Thomson from the Entrepot Collective, to see if they had any space we could use. They didn’t, but they informed me that the building next door to them, a warehouse, had been vacant for a couple of years. So you and I approached the real estate agents for the building. However, when we had a look at it we realised it was much more space than we needed for a gallery. So, playing hardball, I offered them $50/week for the downstairs space, which we thought would be good for a gallery. However, the owners didn’t think that it was enough money for them to bother with. Things went into limbo for a couple of weeks, when you offered the owners $150/week for the entire space (approximately three times the floor space of our original offer), which they accepted. So we now had enough space for studios as well as a gallery. The trick was that the owners wanted the first three months rent in advance, so we had to find artists to fill all the studios and get them all to pay three months rent in advance, and book the first three months of exhibitions with full payment as well. Somehow we did this and, with the help of a loose but very dedicated collection of artists, That Space was born. As an aside, the original name we wanted was simply “That”, but they wouldn’t let us register “That” as a business name, so you came up with the name “That Contemporary Art Space” — I think on the spur of the moment — which got shortened to “That” and “That Space” for everyday use. We didn’t really have a formal structure, at least at the beginning, but I guess we were loosely a collective and the management committee meetings were open to whoever wanted to come along. Exodus: So many artists fled Queensland during The Police State eighties? Did you ever consider leaving Queensland? I left Queensland at the end of 1994. As well as showing in artist-run spaces like That Space, John Mills National, Arch Lane PUBLIC ART, and Galerie Brutal I had also exhibited in institutional spaces like the Institute of Modern Art, MOCA, and the Queensland Art Gallery (and of course on the exterior wall of the New York Guggenheim as part of the Axis Art Project). However I reached a point of stasis where opportunities stopped presenting themselves. It seemed like I had run out of places to go. And while my work was quite well known in Brisbane, it was hardly known at all in the rest of Australia. There are some that have managed to make a art careers for themselves based in Brisbane but it seemed this was not something I was able to do. I guess this has a lot to do with the size of the city – just not enough people to support all the artists. So I headed to Melbourne, both for career and study reasons, where I stayed for twenty years. I think it has been much easier for me to survive financially there than it would have been in Brisbane. There are more educational institutions in Melbourne, so teaching work was much easier to find than it would have been in Brisbane. I am currently in Darwin at the end of a two year lecturing contract. And while I am quite fond of Darwin in many ways, I’ll probably head back to Melbourne in a couple of months. When you left Queensland and relocated to Melbourne was there a feeling of a Queensland diaspora in Melbourne perhaps? I am not sure about diaspora, but at the opening of 2004: Australian Culture Now, at the NGV and ACMI, it felt like there were more ex-Brisbane people there than native Melburnians, and there were a lot of people in attendance — The Atrium was full. Related artist-runs interstate you had a connection to or awareness of ? This is post 1982, but I remember staying at the Ultimo Project, seeing Theatre of the Industrial Trapeze (an extraordinary, fantastical, meandering exhibition in what I remember as a rather large warehouse), and Rondeau, an artist-run gallery, in Sydney. 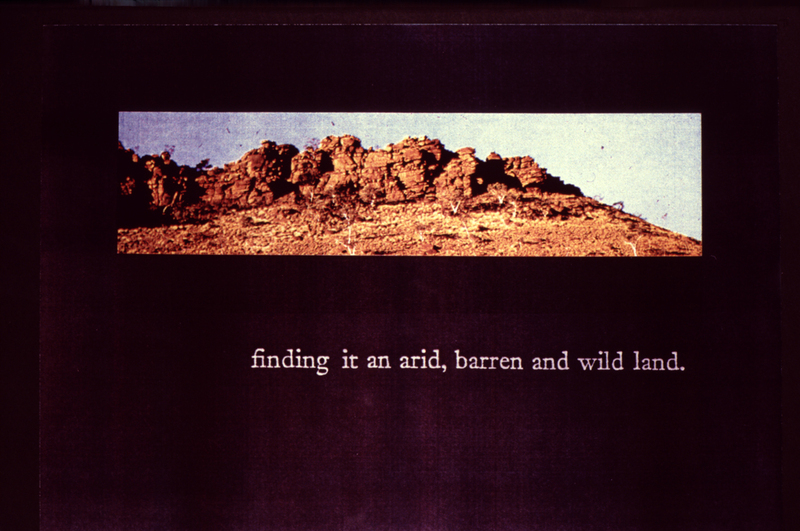 This is the artwork The Great Australian Landscape- Part I Volume II, 1989, and is from a series I was making at the time based on photographs my father had taken in Central Australia during the 1950's. John can you outline the various artist studios you worked in over these years? I like working in shared studios partly because they generally had more space than my home studios, and for the community of artists that evolve from those spaces. My first studio, apart from art college or under my house, was at the Brisbane Community Arts Centre (BCAC). In 1980 they had a floor that they hadn’t developed yet, so they rented part of it out as reasonably cheap artist’s studios. After being at the BCAC for a year or two, I remember going along to Red Comb House to see if there was any vacant studio space there. I thought it would be an interesting group of artists to share with. I think it was Hollie who showed me around. The only space left was upstairs in a room with broken windows which was literally covered with pigeon droppings. I was welcome to clean the place up etc., but decided to stay at the BCAC. Later I moved into a studio in Loch Street, West End. It was a run-down two-storey workshop/warehouse. I think Racheal Bruhn organised it, and for the time that I was there the studio was mostly shared between Hollie, Racheal and me. We had the whole of the first floor — quite a large space. No power or lighting on our level. We got power by running an extension cord from the workshop downstairs. We had to move out when the owners decided to renovate. During the the same period I also had an “office” at That Space, in Charlotte Street. I think it was in 1986/87 that I had spent a year or so largely outside of Brisbane, travelling, and when I arrived back, in mid ’87, That Space gallery was free for a few weeks. So I got to use it as a studio for that time. It was great to come back and land straight into a studio space. It was there that I painted the backdrop for one of the “A Night on the Tiles” gigs. After that I was kindly offered a space in the middle of the John Mills Himself building in Charlotte Street, sharing with Sally Hart and Sheridan Kennedy. I think we sublet from the Entrepot group of QIT architecture students, who had a space at the back. John Mills National had the front space. When the John Mills/Entrepot complex closed down, Mark Davies, who had an upstairs studio in the same building, found a space in Margaret Street in the city. It was a large open space on the first or second story of a warehouse, which we rented from the owner at a fairly modest rate. We shared with Sebastian Di Mauro, Sharon Jewell and Venessa Williams. Our one window had a view over the Queensland Club’s carpark onto the Botanic Gardens — rather nice. Later when the owner thought he could rent out the space at a more commercial rate (to either a ballet or an opera company) we had to move out. We then found a studio (BAF Studio) above the BAFS chemist on the corner of George and Turbot Streets, which included at various stages Mark Davies, Venessa Williams, Sebastian Di Mauro, Sharon Jewell, Tony Adams, myself, and later Peter Besley. Most of the spaces I had come across through word of mouth, but this one I found by ringing around real estate agents. Of course most of them had no suitable properties but one agent had a space that he didn’t know what to do with — until I rang. The main space had been originally built as a dance hall. It was a large open space with polished floor boards, on the second floor. The BAFS chemist rented it out to us quite cheaply as they felt they were in the business of running pharmacies and not renting spaces, so they didn’t want to spend time and money doing the place up. I stayed at BAF Studio for about five years before moving to Melbourne at the end of 1994. The studio lasted another couple of years in that location. However, when they finally wanted to redevelop our floor, the BAFS chemist offered Mark the upstairs floor above their pharmacy in Woolloongabba, and offer which Mark took up, and stayed for at least a few years.